When writing about the supernatural, authors need to follow the rules. They must observe certain conventions. For example, vampires have to avoid sunlight, and they cannot enter a home unless invited. Fairies are surprisingly unpleasant creatures known for stealing away human infants and leaving their own changelings behind. And shapeshifting werewolves turn at the full moon and acquire new recruits by biting people. We expect to see these elements in such stories. But Kenneth Oppel creates a darkly gothic world so unique it’s not bound by literary traditions; he gets to make up his own. A bird skeleton becomes a clock. A child is built of mud and hair. Beautiful butterflies feed upon the living and deliver their life force to an embryonic prehistoric creature. And one drop of a 300-year-old potion allows Victor Frankenstein to enter the spirit world and see his beloved twin brother once more. 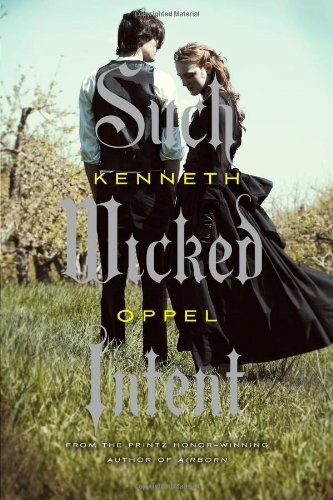 Such Wicked Intent is Mr. Oppel’s second book in the planned trilogy standing as the prequel to Mary Shelley’s classic story of Frankenstein and his monster. He populates his story with younger versions of the characters in Shelley’s book: Victor Frankenstein; feisty Elizabeth Lavenza, a distant cousin adopted by the wealthy family; and close friend, Henry Clerval. In Mr. Oppel’s previous book, Dark Endeavor, Victor, Elizabeth, and Henry failed in their attempt to save the life of Victor’s identical twin, Konrad, with an alchemical potion whose formula they found in Agrippa’s Occulta Philosophia, a book hidden in the Dark Library of the family chateau outside Geneva. Such Wicked Intent opens with Victor burning the entire contents of the Dark Library and swearing off the mystical sciences forever. He also vows to cease coveting Elizabeth, his dead twin’s betrothed. But what 16-year-old can hold to such promises when the unknown is so very tempting? One “book” remains in the ashes of the library bonfire—actually a metal box containing everything needed to construct a Ouija board-like device that spells out, “Come raise me.” Victor, Elizabeth, and Henry are certain the message is from Konrad. Part of the device is a key to a room hidden in the ceiling of the manor’s chapel where Victor’s ancestor, Wilhelm Frankenstein, left clues to a portal into the spirit world. Victor enters the spirit realm for the first time and immediately finds his brother’s ghost. Victor swears he will find a way to raise Konrad from the dead. Konrad warns of an unknown danger lurking beneath the chateau and of a fog prowling at the windows seeking entry into the house. Elizabeth and Henry soon join Victor in his frequent visits to Konrad’s world. Elizabeth is optimistic about being reunited with her intended when he’s returned to life. In the real world, Victor’s father has discovered a honeycomb of prehistoric caves beneath the chateau and invited archeologists to study them. The walls are covered with pictures annotated by a language no one has ever seen. One of the spirit world’s black butterflies has returned with Victor and it enables him to read the ancient words: they tell how to raise a person from the dead. Victor, Elizabeth, and Henry visit Konrad in the spirit world and begin to plan how to unite the two worlds, the action careening back and forth between the real world and the spirit world. The author deftly sets the scene for his next book in the final pages. In Shelley’s book, first published anonymously in London in 1818, Victor attends a German university where he learns of galvanism, the newly discovered method of using electricity to reanimate the dead. Even though the astute reader can guess what will happen in the final book of the trilogy, reading about the imagined origins of the enduring story of Frankenstein and his monster is an adventure to anticipate. Just how far will someone go to see a beloved person live again?